Well-educated pop culture, fiction, and sports. In light of this week’s MLB All-Star game, I grew inspired. Since I have a profound passion for baseball and statistics (I’m currently in three fantasy baseball leagues), I decided to search the internet for Billy Chapel’s career numbers. 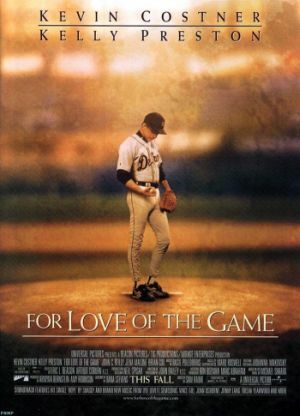 Billy Chapel, a fictional legendary Detroit Tigers pitcher played by actor Kevin Costner, is the lead character in “For Love of the Game,” which is one of my favorite movies. I had originally planned on ranking the film in my Top 50, which is a segment I will be starting on Miserable Retail Slave. However, despite the fact that it ranks much better than 50, I wanted to make sure I pumped this particular post out before the All-Star game for our baseball theme this week. During my internet search, I came across hundreds of sites that make mention of the fictional Billy Chapel. There are many discussion boards that focus on Chapel’s numbers, but oddly there are no statistical predictions out there. Most of these discussion boards talk about the only statistics that are known – Chapel’s 1999 season, which is displayed on screen during the movie as he begins what will turn out to be a perfect game in his final Major League start. I even found a joke during my search: “Jim Joyce would have robbed Billy Chapel of a perfect game.” (Read my Miserable Retail Slave post about Armando Galarraga’s near-perfect game) I suppose you may have to be a Tigers fan to find it funny. When I didn’t find any fictional numbers for Chapel, I decided to research the movie and come up with my own predictions. I based my numbers off various details. For instance, at one point Chapel’s trainer mentions to him that he should retire because he’s won “every award there is to win.” This, to me, suggests that Chapel won the American League Rookie of the Year Award, at least one Cy Young Award, and one Most Valuable Player Award. So, by taking his age, 40, and subtracting his 19 seasons in the Majors, I concluded that his rookie year was the strike-shortened 1981 season. I also researched the Tigers records during Chapel’s career, and drew parallels between his numbers and the team’s success. During good years, like Detroit’s 1984 World Series Title, Chapel had his best numbers. During down years, like his injury-shortened 1996 season, his numbers suffered. So, because a Tiger won the MVP award in 1984 (their closer, Willie Hernandez), I decided to instead make that Chapel’s MVP season. Another factor I took into consideration was just how famous he is in the movie. One internet discussion board suggests that Chapel’s career numbers would be similar to Tom Glavine’s, who was a workhorse that did everything right, but nothing flashy. However, this type of pitcher is not overwhelmingly famous, and that does not mirror Chapel. So I concluded that Chapel must be – or at least had been before his injury – a dominating pitcher who could strike a plethora of batters out. After all, it is the flashy player who gets the media and fame, like Roger Clemens and Nolan Ryan, who would have competed with Chapel statistically during that time. Finally, I researched pitching leaders for the seasons that Chapel would have played, and rendered statistics that would have competed with the league leaders during his prime. I made sure to give him numbers that would have led the league numerous times in order to further justify his fame. Also, I made sure his career statistics correlated with announcer Vin Scully’s statement that Chapel had “trudged to the mound for over 4100 innings in his career.” Chapel came up short of the 300 win mark, but passed the 3000 strikeout mark, and finished with a 2.95 earned run average and a 1.15 WHIP (learn how to calculate ERA and WHIP here), which are all Hall of Fame numbers. Wow. Those stats are amazing. Nice work. Also, he mentions to her daughter that he had a bad season, but that it was almost over. I suspect that’s his 2nd last season. Thanks for commenting, Randy. I took all of these things into account. However, if you recall from the statistics they show on-screen during his final start, Chapel did indeed log one complete game before the perfecto. Ironically, the one statistical error I made was forgetting about that complete game, and only giving him the one. By the way, the bad season Chapel speaks of is mostly in reference to Detroit’s terrible season. If you see in my explanation, I intentionally drew parallels between Chapel’s “bad” seasons and the team’s. I watched it again last night. Enjoyed it again. For any baseball junkie, just a great movie. The scene at the beginning of the bottom of the eighth when he asked Gus if anyone had been on base was truly a fine moment. Later, I began to wonder about career. But maybe he was closer to 300 if the Giants would actually want him in a trade at that point which would be the only reason to take on a 40 year old power pitcher past his prime. Love it. I was curious what his numbers would look like. Only thing I caught that is a bit of an error is during the movie when Billy and Jane are having dinner… Billy tells Jane he has lost 134 times in 15 seasons. Yet, you have him lose 151 times in 15 seasons. Just thought I’d point that out. Great work though! Thanks for sharing. I think you’ve done a great job here. This is the movie that got me into baseball (I’m English but saw it 3 times on a Melbourne to London flight). I’d have liked to have seen him be closer to 300 wins – making it harder to give up with the great prize within another season – but I like your analysis very much. Very nice job. Would’ve thought maybe a little closer to the 300k mark in the first two CY years. Especially ’84. Check out Miserable Retail Slave! How Many People Actually Read This? If this blog isn't just a waste of time, click to subscribe and receive notifications of new posts by email.